The front page of Tuesday's Belfast Telegraph is almost Brexit free, concentrating on a health story. Billed as an exclusive, the Telegraph presents the "human face" of Northern Ireland's heath service crisis. "Boy aged 10 faces nearly four years of agony awaiting surgery," is the stark headline. That boy is Zac Wallace-Plews, who could be facing a four-year-wait before he can get surgery to deal with a medical condition. His mother describes that wait as "cruel". The story has prompted the paper to highlight the pressure on the health system in its editorial saying that ministerial decisions are needed to bring about the changes needed. The Telegraph asks, with the Stormont Assembly and Executive in abeyance for a year, where is the respect of politicians for people in urgent need of healthcare? In an almost politically free story, the Belfast Telegraph shows a picture of the Christmas Tree in Newry City, which has been described as "bland". Some locals have described the forlorn fir as "disgusting". One three-year-old said it "looks sick" the paper reports. "Dress it up or take it down," was the view of one of the city's councillors. The Belfast Telegraph also carries two pages of coverage of the views of some former members of the security forces in Northern Ireland concerned at what they describe as a "witch-hunt" against them. The group, Northern Ireland Crown Forces Veterans for Justice, opposes an amnesty for terrorists and backs a statute of limitations to ensure that no former soldiers or police officers are charged with historic Troubles related offences. The Irish News leads with a response from the Taoiseach (Irish prime minister) Leo Varadkar to a letter signed by prominent members of the nationalist community calling on him to protect the rights of Irish citizens in Northern Ireland. A spokesperson for Mr Varadkar has said that he hopes to soon see the restoration of power sharing in Northern Ireland and referred to a pledge made by the Taoiseach to protect the interests of Irish citizens in the Brexit negotiations. The lawyer behind the letter has described it as an "uprising". The Irish News journalist Allison Morris says it is part of "nationalist spring". In contrast, unionist politicians have criticised the letter, saying it "could have come straight from Sinn Féin", the News Letter reports. Its leader column says that unionist scepticism about the letter is "entirely justified". Describing the contents as "clearly reflecting Sinn Féin's analysis and viewpoints" the editorial suggests that the 200 signatories should realise that the blame for their lack of political voice lies with nationalist politicians and Sinn Féin in particular. 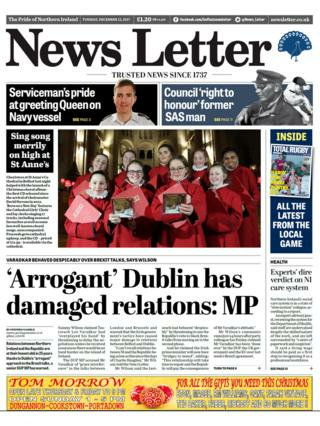 The News Letter front page brings us back to Brexit and comments from the DUP MP Sammy Wilson on the Irish government's approach to the Brexit negotiations. Mr Wilson says that relations between Northern Ireland and the Republic are at their lowest ebb in 25 years due to Dublin's "arrogant" actions..
Mr Wilson accused the Taoiseach Leo Varadkar of "grave interference" in the UK's talks with Brussels.